The steampunk stealth-action game Dishonored is coming in October. Once, you were the most trusted bodyguard of the Empress. But framed for her murder, you were forced to become something else entirely: an assassin of almost legendary ability, blessed or cursed with supernatural abilities by an unknown force. And now, you're after revenge. That's the setup in Dishonored, the new stealth-action game from Dark Messiah studio Arkane that takes place in the steampunk-inspired "industrial whaling city" of Dunwall. The setting alone has me pretty wound up, but it's the promise of "Choose Your Own Homicide" gameplay that really does it for me. Do you stealth this guy? Yell and scream and chop him up into little pieces with a battleax? Or maybe use some of that hoodoo-voodoo stuff on him? You decide! Of course, we won't know how well it actually plays for awhile, because the game won't be out until October - October 9 in North America, to be precise, and October 12 in Europe. In the meantime, have a look at the official box art, which I think can best be described as "okay" but not much more. It's a nice rendering of the lead character's groovy murder mask and I suppose that funky clock tower in the background is there to remind everyone that this is a steampunk joint, but all in all it's pretty flat. Hope the game shows a little more inspiration. So remember: October 9, or October 12 if you're on the wrong side of the wet fantastic, for the Xbox 360, PlayStation 3 and PC. 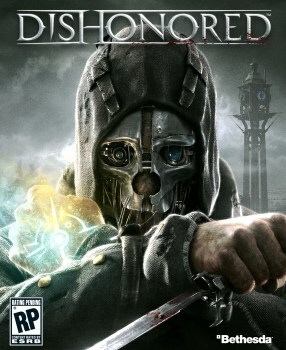 To find out more about Dishonored, check out www.dishonored.com.